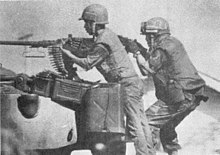 The Tet Offensive (Vietnamese: Sự kiện Tết Mậu Thân 1968), or officially called The General Offensive and Uprising of Tet Mau Than 1968 (Vietnamese: Tổng Tiến công và Nổi dậy Tết Mậu Thân 1968) by North Vietnam and the Viet Cong, was one of the largest military campaigns of the Vietnam War, launched on January 30, 1968, by forces of the Viet Cong and North Vietnamese People's Army of Vietnam against the forces of the South Vietnamese Army of the Republic of Vietnam, the United States Armed Forces, and their allies. It was a campaign of surprise attacks against military and civilian command and control centers throughout South Vietnam. The name of the offensive comes from the Tết holiday, the Vietnamese New Year, when the first major attacks took place. The offensive was launched prematurely in the late night hours of 30 January in the I and II Corps Tactical Zones of South Vietnam. This early attack allowed South Vietnamese and US forces some time to prepare defensive measures. When the main North Vietnamese operation began the next morning, the offensive was countrywide and well coordinated; eventually more than 80,000 North Vietnamese and Viet Cong troops struck more than 100 towns and cities, including 36 of 44 provincial capitals, five of the six autonomous cities, 72 of 245 district towns, and the southern capital. The offensive was the largest military operation conducted by either side up to that point in the war. Hanoi had launched the offensive in the belief that the offensive would trigger a popular uprising leading to the collapse of the South Vietnamese government. Although the initial attacks stunned both the U.S. and South Vietnamese armies, causing them to lose control of several cities temporarily, they quickly regrouped, beat back the attacks, and inflicted heavy casualties on North Vietnamese and Vietcong forces. The popular uprising anticipated by Hanoi never happened. During the Battle of Huế, intense fighting lasted for a month, resulting in the destruction of the city. During their occupation, the North Vietnamese executed thousands of people in the Massacre at Huế. Around the U.S. combat base at Khe Sanh, fighting continued for two more months. The offensive was a military defeat for North Vietnam though General Westmoreland reported that defeating the North Vietnamese and Viet Cong would require 200,000 more American soldiers and activation of the reserves, prompting even loyal supporters of the war to see that the current war strategy required re-evaluation. The offensive had a strong effect on the U.S. government and shocked the U.S. public, which had been led to believe by its political and military leaders that the North Vietnamese were being defeated and incapable of launching such an ambitious military operation; American public support for the war soon declined and the U.S. sought negotiations to end the war. 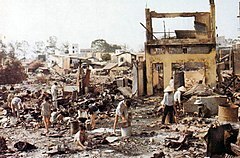 The term "Tet Offensive" usually refers to the January–February 1968 offensive, but it can also include the so-called "Mini-Tet" offensive that took place in May and the Phase III Offensive in August, or the 21 weeks of unusually intense combat which followed the initial attacks in January. During the fall of 1967, the question whether the U.S. strategy of attrition was working in South Vietnam weighed heavily on the minds of the American public and the administration of President Lyndon B. Johnson. 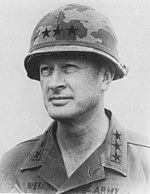 General William C. Westmoreland, the commander of the Military Assistance Command, Vietnam (MACV), believed that if a "crossover point" could be reached by which the number of communist troops killed or captured during military operations exceeded those recruited or replaced, the Americans would win the war. There was a discrepancy, however, between the order of battle estimates of the MACV and the Central Intelligence Agency (CIA) concerning the strength of Viet Cong guerrilla forces within South Vietnam. In September, members of the MACV intelligence services and the CIA met to prepare a Special National Intelligence Estimate that would be used by the administration to gauge U.S. success in the conflict. Provided with an enemy intelligence windfall accrued during Operations Cedar Falls and Junction City, the CIA members of the group believed that the number of Vietcong guerrillas, irregulars, and cadre within the South could be as high as 430,000. The MACV Combined Intelligence Center, on the other hand, maintained that the number could be no more than 300,000. Westmoreland was deeply concerned about the possible perceptions of the American public to such an increased estimate since communist troop strength was routinely provided to reporters during press briefings. According to MACV's chief of intelligence, General Joseph A. McChristian, the new figures "would create a political bombshell", since they were positive proof that the North Vietnamese "had the capability and the will to continue a protracted war of attrition". In May, MACV attempted to obtain a compromise from the CIA by maintaining that Viet Cong militias did not constitute a fighting force but were essentially low-level fifth columnists used for information collection. The agency responded that such a notion was ridiculous since the militias were directly responsible for half of the casualties inflicted on U.S. forces. With the groups deadlocked, George Carver, CIA deputy director for Vietnamese affairs, was asked to mediate the dispute. In September, Carver devised a compromise: The CIA would drop its insistence on including the irregulars in the final tally of forces and add a prose addendum to the estimate that would explain the agency's position. George Allen, Carver's deputy, laid responsibility for the agency's capitulation at the feet of Richard Helms, the director of the CIA. He believed that "it was a political problem ... [Helms] didn't want the agency ... contravening the policy interest of the administration." During the second half of 1967 the administration had become alarmed by criticism, both inside and outside the government, and by reports of declining public support for its Vietnam policies. According to public opinion polls, the percentage of Americans who believed that the U.S. had made a mistake by sending troops to Vietnam had risen from 25 percent in 1965 to 45 percent by December 1967. This trend was fueled not by a belief that the struggle was not worthwhile, but by mounting casualty figures, raising taxes, and the feeling that there was no end to the war in sight. A poll taken in November indicated that 55 percent wanted a tougher war policy, exemplified by the public belief that "it was an error for us to have gotten involved in Vietnam in the first place. But now that we're there, let's win – or get out." This prompted the administration to launch a so-called "Success Offensive", a concerted effort to alter the widespread public perception that the war had reached a stalemate and to convince the American people that the administration's policies were succeeding. Under the leadership of National Security Advisor Walt W. Rostow, the news media then was inundated by a wave of effusive optimism. Every statistical indicator of progress, from "kill ratios" and "body counts" to village pacification, was fed to the press and to the Congress. "We are beginning to win this struggle", asserted Vice President Hubert H. Humphrey on NBC's Today show in mid-November. "We are on the offensive. The territory is being gained. We are making steady progress." At the end of November, the campaign reached its climax when Johnson summoned Westmoreland and the new U.S. Ambassador, Ellsworth Bunker, to Washington, D.C., for what was billed as a "high-level policy review". Upon their arrival, the two men bolstered the administration's claims of success. From Saigon, pacification chief Robert Komer asserted that the CORDS pacification program in the countryside was succeeding, and that sixty-eight percent of the South Vietnamese population was under the control of Saigon while only seventeen percent was under the control of the Viet Cong. General Bruce Palmer Jr., one of Westmoreland's three Field Force commanders, claimed that "the Viet Cong has been defeated" and that "He can't get food and he can't recruit. He has been forced to change his strategy from trying to control the people on the coast to try to survive in the mountains." Westmoreland was even more emphatic in his assertions. At an address at the National Press Club on 21 November, he reported that, as of the end of 1967, the communists were "unable to mount a major offensive ... I am absolutely certain that whereas in 1965 the enemy was winning, today he is certainly losing...We have reached an important point when the end begins to come into view." By the end of the year the administration's approval rating had indeed crept up by eight percent, but an early January Gallup poll indicated that forty-seven percent of the American public still disapproved of the President's handling of the war. The American public, "more confused than convinced, more doubtful than despairing ... adopted a 'wait and see' attitude." During a discussion with an interviewer from Time magazine, Westmoreland defied the communists to launch an attack: "I hope they try something because we are looking for a fight." Planning in Hanoi for a winter-spring offensive during 1968 had begun in early 1967 and continued until early the following year. According to American sources, there has been an extreme reluctance among Vietnamese historians to discuss the decision-making process that led to the General Offensive General Uprising, even decades after the event. In official Vietnamese literature, the decision to launch the Tet Offensive was usually presented as the result of a perceived U.S. failure to win the war quickly, the failure of the American bombing campaign against North Vietnam, and the anti-war sentiment that pervaded the population of the U.S. The decision to launch the general offensive, however, was much more complicated. The decision signaled the end of a bitter, decade-long debate within the North Vietnamese Government between first two, and then three factions. The moderates believed that the economic viability of North Vietnam should come before support of a massive and conventional southern war and they generally followed the Soviet line of peaceful coexistence by reunifying Vietnam through political means. Heading this faction were party theoretician Trường Chinh and Minister of Defense Võ Nguyên Giáp. The militant faction, on the other hand, tended to follow the foreign policy line of the People's Republic of China and called for the reunification of the nation by military means and that no negotiations should be undertaken with the Americans. This group was led by Communist Party First Secretary Lê Duẩn and Lê Đức Thọ (no relation). From the early to mid-1960s, the militants had dictated the direction of the war in South Vietnam. General Nguyễn Chí Thanh the head of Central Office for South Vietnam (COSVN), headquarters for the South, was another prominent militant. The followers of the Chinese line centered their strategy against the US and its allies on large-scale, main force actions rather than the protracted guerrilla war espoused by Mao Zedong. 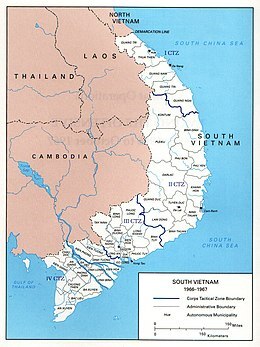 By 1966–1967, however, after suffering massive casualties, stalemate on the battlefield, and destruction of the northern economy by U.S. aerial bombing, there was a dawning realization that if current trends continued, Hanoi would eventually lack the resources necessary to affect the military situation in the South. As a result, there were more strident calls by the moderates for negotiations and a revision of strategy. They felt that a return to guerrilla tactics was more appropriate since the U.S. could not be defeated conventionally. They also complained that the policy of rejecting negotiations was in error. The Americans could only be worn down in a war of wills during a period of "fighting while talking". During 1967 things had become so bad on the battlefield that Lê Duẩn ordered Thanh to incorporate aspects of protracted guerrilla warfare into his strategy. During the same period, a counter-attack was launched by a new, third grouping (the centrists) led by President Hồ Chí Minh, Lê Đức Thọ, and Foreign Minister Nguyễn Duy Trinh, who called for negotiations. From October 1966 through April 1967, a very public debate over military strategy took place in print and via radio between Thanh and his rival for military power, Giáp. Giáp had advocated a defensive, primarily guerrilla strategy against the U.S. and South Vietnam. Thanh's position was that Giáp and his adherents were centered on their experiences during the First Indochina War and that they were too "conservative and captive to old methods and past experience... mechanically repeating the past." The arguments over domestic and military strategy also carried a foreign policy element, as North Vietnam, like South Vietnamese forces, was largely dependent on outside military and economic aid. The vast majority of North Vietnam's military equipment was provided by either the Soviet Union or China. Beijing advocated that North Vietnam conduct a protracted war on the Maoist model, fearing that a conventional conflict might draw China in, as had happened in the Korean War. They also resisted the idea of negotiating with the allies. Moscow, on the other hand, advocated negotiations, but simultaneously armed Hanoi's forces to conduct a conventional war on the Soviet model. North Vietnamese foreign policy therefore consisted of maintaining a critical balance between war policy, internal and external policies, domestic adversaries, and foreign allies with "self-serving agendas." To "break the will of their domestic opponents and reaffirm their autonomy vis-à-vis their foreign allies", hundreds of pro-Soviet, party moderates, military officers, and intelligentsia were arrested on 27 July 1967, during what came to be called the Revisionist Anti-Party Affair. All of the arrests were based on the individual's stance on the Politburo's choice of tactics and strategy for the proposed General Offensive. This move cemented the position of the militants as Hanoi's strategy: the rejection of negotiations, the abandonment of protracted warfare, and the focus on the offensive in the towns and cities of South Vietnam. More arrests followed in November and December. The operational plan for the General Offensive and Uprising had its origin as the "COSVN proposal" at Thanh's southern headquarters in April 1967 and had then been relayed to Hanoi the following month. The General was then ordered to the capital to explain his concept in person to the Military Central Commission. At a meeting in July, Thanh briefed the plan to the Politburo. On the evening of 6 July, after receiving permission to begin preparations for the offensive, Thanh attended a party and died of a heart attack after drinking too much. After cementing their position during the Party crackdown, the militants sped up planning for a major conventional offensive to break the military deadlock. They concluded that the Saigon government and the U.S. presence were so unpopular with the population of the South that a broad-based attack would spark a spontaneous uprising of the population, which, if the offensive was successful, would enable the North Vietnamese to sweep to a quick, decisive victory. Their basis for this conclusion included: a belief that the South Vietnamese military was no longer combat-effective; the results of the September 1967 South Vietnamese presidential election (in which the Nguyễn Văn Thiệu/Nguyễn Cao Kỳ ticket had only received 24 percent of the popular vote); the Buddhist crises of 1963 and 1966; well-publicized anti-war demonstrations in Saigon; and continuous criticism of the Thiệu government in the southern press. Launching such an offensive would also finally put an end to what have been described as "dovish calls for talks, criticism of military strategy, Chinese diatribes of Soviet perfidy, and Soviet pressure to negotiate—all of which needed to be silenced." In October, the Politburo decided on the Tet holiday as the launch date and met again in December to reaffirm its decision and formalize it at the 14th Plenary session of the Party Central Committee in January 1968. The resultant Resolution 14 was a major blow to domestic opposition and "foreign obstruction". Concessions had been made to the center group, however, by agreeing that negotiations were possible, but the document essentially centered on the creation of "a spontaneous uprising in order to win a decisive victory in the shortest time possible." Contrary to Western belief, General Giáp did not plan or command the offensive himself. Thanh's original plan was elaborated on by a party committee headed by Thanh's deputy, Phạm Hùng, and then modified by Giáp. The Defense Minister may have been convinced to toe the line by the arrest and imprisonment of most of the members of his staff during the Revisionist Anti-Communist Party Affair. Although Giáp went to work "reluctantly, under duress", he may have found the task easier due to the fact that he was faced with a fait accompli. Since the Politburo had already approved the offensive, all he had to do was make it work. He combined guerrilla operations into what was basically a conventional military offensive and shifted the burden of sparking the popular uprising to the Viet Cong. If it worked, all would be well and good. If it failed, it would be a failure only for the Communist Party militants. For the moderates and centrists, it offered the prospect of negotiations and a possible end to the American bombing of the North. Only in the eyes of the militants, therefore, did the offensive become a "go for broke" effort. Others in the Politburo were willing to settle for a much less ambitious "victory". The PAVN official history states that the objectives of the Tet Offensive were to: annihilate and cause the total disintegration of the bulk of the puppet army, overthrow the puppet regime at all administrative levels, and place all government power in the hands of the people. Annihilate a significant portion of the American Military's troop strength and destroy a significant portion of his war equipment in order to prevent the American forces from being able to carry out their political and military missions; on the basis, crush the American will to commit aggression and force the United States to accept defeat in South Vietnam and end all hostile actions against North Vietnam. In addition, using this as the basis, they would achieve the immediate goals of the revolution, which were independence, democracy, peace, and neutrality in South Vietnam, and then move toward achieving peace and national unification. The operation would involve a preliminary phase, during which diversionary attacks would be launched in the border areas of South Vietnam to draw American attention and forces away from the cities. The General Offensive, General Uprising would then commence with simultaneous actions on major allied bases and most urban areas, and with particular emphasis on the cities of Saigon and Huế. Concurrently, a substantial threat would have to be made against the U.S. combat base at Khe Sanh. The Khe Sanh actions would draw North Vietnamese forces away from the offensive into the cities, but Giáp considered them necessary in order to protect his supply lines and divert American attention. 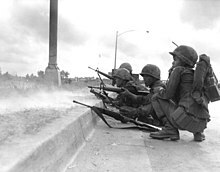 Attacks on other U.S. forces were of secondary, or even tertiary importance, since Giáp considered his main objective to be weakening or destroying the South Vietnamese military and government through popular revolt. The offensive, therefore, was aimed at influencing the South Vietnamese public, not that of the U.S. There is conflicting evidence as to whether, or to what extent, the offensive was intended to influence either the March primaries or the November presidential election in the U.S. According to General Trần Văn Trà, the new military head of COSVN, the offensive was to have three distinct phases: Phase I, scheduled to begin on 30 January, would be a countrywide assault on the cities, conducted primarily by Viet Cong forces. Concurrently, a propaganda offensive to induce ARVN troops to desert and the South Vietnamese population to rise up against the government would be launched. If outright victory was not achieved, the battle might still lead to the creation of a coalition government and the withdrawal of the Americans. If the general offensive failed to achieve these purposes, follow-up operations would be conducted to wear down the enemy and lead to a negotiated settlement; Phase II was scheduled to begin on 5 May, and Phase III on 17 August. South Vietnamese and U.S. military intelligence estimated that North Vietnamese and Viet Cong forces in South Vietnam during January 1968 totaled 323,000 men, including 130,000 North Vietnamese regulars, 160,000 Viet Cong and members of the infrastructure, and 33,000 service and support troops. They were organized into nine divisions composed of 35 infantry and 20 artillery or anti-aircraft artillery regiments, which were, in turn, composed of 230 infantry and six sapper battalions. Signs of impending communist action were noticed among the allied intelligence collection apparatus in Saigon. During the late summer and fall of 1967 both South Vietnamese and U.S. intelligence agencies collected clues that indicated a significant shift in communist strategic planning. By mid-December, mounting evidence convinced many in Washington and Saigon that something big was underway. During the last three months of the year intelligence agencies had observed signs of a major North Vietnamese military buildup. 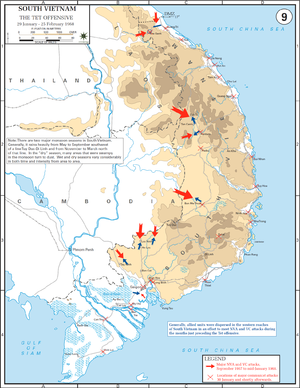 In addition to captured documents (a copy of Resolution 13, for example, was captured by early October), observations of enemy logistical operations were also quite clear: in October, the number of trucks observed heading south through Laos on the Hồ Chí Minh Trail jumped from the previous monthly average of 480 to 1,116. By November this total reached 3,823 and, in December, 6,315. On 20 December, Westmoreland cabled Washington that he expected the Viet Cong and North Vietnamese "to undertake an intensified countrywide effort, perhaps a maximum effort, over a relatively short period of time." Despite all the warning signs, however, the allies were still surprised by the scale and scope of the offensive. According to ARVN Colonel Hoang Ngoc Lung the answer lay with the allied intelligence methodology itself, which tended to estimate the enemy's probable course of action based upon their capabilities, not their intentions. Since, in the allied estimation, the communists hardly had the capability to launch such an ambitious enterprise: "There was little possibility that the enemy could initiate a general offensive, regardless of his intentions." The answer could also be partially explained by the lack of coordination and cooperation between competing intelligence branches, both South Vietnamese and American. The situation from the U.S. perspective was summed up by an MACV intelligence analyst: "If we'd gotten the whole battle plan, it wouldn't have been believed. It wouldn't have been credible to us." From spring through the fall of 1967, the U.S. Command in Saigon was perplexed by a series of actions initiated by the North Vietnamese and the Viet Cong in the border regions. On 24 April a U.S. Marine Corps patrol prematurely triggered a North Vietnamese offensive aimed at taking the airstrip and combat base at Khe Sanh, the western anchor of the Marines' defensive positions in Quảng Trị Province. By the time the action there had ended in May, 940 North Vietnamese troops and 155 Marines had been killed. For 49 days during early September and lasting into October, the North Vietnamese began shelling the U.S. Marine outpost of Con Thien, just south of the Demilitarized Zone or DMZ. The intense shelling (100–150 rounds per day) prompted Westmoreland to launch Operation Neutralize, an intense aerial bombardment campaign of 4,000 sorties into and just north of the demarcation line. On 27 October, an ARVN battalion at Sông Bé, the capital of Phước Long Province, came under attack by an entire North Vietnamese regiment. Two days later, another North Vietnamese Regiment attacked a U.S. Special Forces border outpost at Lộc Ninh, in Bình Long Province. This attack sparked a ten-day battle that drew in elements of the U.S. 1st Infantry Division and the ARVN 18th Division and left 800 North Vietnamese troops dead at its conclusion. The most severe of what came to be known as "the Border Battles" erupted during October and November around Dak To, another border outpost in Kon Tum Province. The clashes there between the four regiments of the 1st North Vietnamese Division, the U.S. 4th Infantry Division, the U.S. 173rd Airborne Brigade, and ARVN infantry and Airborne elements, lasted for 22 days. By the time the fighting was over, between 1,200 and 1,600 North Vietnamese and 262 U.S. troops had lost their lives. MACV intelligence was confused by the possible motives of the North Vietnamese in prompting such large-scale actions in remote regions where U.S. artillery and aerial firepower could be applied indiscriminately, which meant that tactically and strategically, these operations made no sense. What the North Vietnamese had done was carry out the first stage of their plan: to fix the attention of the U.S. Command on the borders and draw the bulk of U.S. forces away from the heavily populated coastal lowlands and cities. 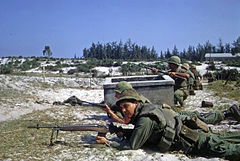 Westmoreland was more concerned with the situation at Khe Sanh, where, on 21 January, a force estimated at 20,000–40,000 North Vietnamese troops had besieged the U.S. Marine garrison. MACV was convinced that the North Vietnamese planned to stage an attack and overrun the base as a prelude to an all-out effort to seize the two northernmost provinces of South Vietnam. To deter any such possibility, he deployed 250,000 men, including half of MACV's U.S. maneuver battalions, to the I Corps Tactical Zone. This course of events disturbed Lieutenant General Frederick Weyand, commander of U.S. forces in III Corps, which included the Capital Military District. Weyand, a former intelligence officer, was suspicious of the pattern of communist activities in his area of responsibility and notified Westmoreland of his concerns on 10 January. Westmoreland agreed with his estimate and ordered 15 U.S. battalions to redeploy from positions near the Cambodian border back to the outskirts of Saigon. When the offensive did begin, a total of 27 allied maneuver battalions defended the city and the surrounding area. This redeployment may have been one of the most critical tactical decisions of the war. By the beginning of January 1968, the U.S. had deployed 331,098 Army personnel and 78,013 Marines in nine divisions, an armoured cavalry regiment, and two separate brigades to South Vietnam. They were joined there by the 1st Australian Task Force, a Royal Thai Army regiment, two South Korean infantry divisions, and a Republic of Korea Marine Corps brigade. South Vietnamese strength totaled 350,000 regulars in the Army, Air Force, Navy, and Marine Corps. They were in turn supported by the 151,000-man South Vietnamese Regional Forces and 149,000-man South Vietnamese Popular Forces, which were the equivalent of regional and local militias. In the days immediately preceding the offensive, the preparedness of allied forces was relatively relaxed. Hanoi had announced in October that it would observe a seven-day truce from 27 January to 3 February for the Tet holiday, and the South Vietnamese military made plans to allow recreational leave for approximately half of its forces. General Westmoreland, who had already cancelled the truce in I Corps, requested that its ally cancel the upcoming cease-fire, but President Thiệu (who had already reduced the cease-fire to 36 hours), refused to do so, claiming that it would damage troop morale and only benefit communist propagandists. On 28 January, eleven Viet Cong cadres were captured in the city of Qui Nhơn while in possession of two pre-recorded audio tapes whose message appealed to the populace in "already occupied Saigon, Huế, and Da Nang". The following afternoon, General Cao Văn Viên, chief of the Vietnamese Joint General Staff, ordered his four corps commanders to place their troops on alert. Yet, there was still a lack of a sense of urgency on the part of the allies. If Westmoreland had a grasp of the potential for danger, he did not communicate it very well to others. On the evening of 30 January, 200 U.S. officers—all of whom served on the MACV intelligence staff—attended a pool party at their quarters in Saigon. According to James Meecham, an analyst at the Combined Intelligence Center who attended the party: "I had no conception Tet was coming, absolutely zero ... Of the 200-odd officers present, not one I talked to knew Tet was coming, without exception." The General also failed to communicate his concerns adequately to Washington. Although he had warned the President between 25 and 30 January that "widespread" communist attacks were in the offing, his admonitions had tended to be so oblique or so hedged with official optimism that even the administration was unprepared. No one – in either Washington or Vietnam – was expecting what happened. Lt. Gen. Frederick Weyand invited CBS News Correspondent John Laurence and Washington Post reporter Don Oberdorfer to his III Corps headquarters in the week before the Tet Offensive to alert them that a major enemy attack was coming "just before or just after Tet." He said the Vietnamese had too much respect for the holiday to attack during Tet itself. Weyand said he had moved 30 U.S. and South Vietnamese battalions closer to Saigon to defend the city. —  Message to North Vietnamese forces who were informed that they were "about to inaugurate the greatest battle in the history of our country". Whether by accident or design, the first wave of attacks began shortly after midnight on 30 January as all five provincial capitals in II Corps and Da Nang, in I Corps, were attacked. Nha Trang, headquarters of the U.S. I Field Force, was the first to be hit, followed shortly by Ban Mê Thuột, Kon Tum, Hội An, Tuy Hòa, Da Nang, Qui Nhơn, and Pleiku. During all of these operations, the Viet Cong and North Vietnamese followed a similar pattern: mortar or rocket attacks were closely followed by massed ground assaults conducted by battalion-strength elements of the Viet Cong, sometimes supported by North Vietnamese regulars. These forces would join with local cadres who served as guides to lead the regulars to the most senior South Vietnamese headquarters and the radio station. The operations, however, were not well coordinated at the local level. By daylight, almost all communist forces had been driven from their objectives. General Phillip B. Davidson, the new MACV chief of intelligence, notified Westmoreland that "This is going to happen in the rest of the country tonight and tomorrow morning." All U.S. forces were placed on maximum alert and similar orders were issued to all ARVN units. The allies, however, still responded without any real sense of urgency. Orders cancelling leaves either came too late or were disregarded. At 03:00 on 31 January North Vietnamese forces assailed Saigon, Cholon, and Gia Định in the Capital Military District; Quảng Trị (again), Huế, Quảng Tín, Tam Kỳ, and Quảng Ngãi as well as U.S. bases at Phú Bài and Chu Lai in I Corps; Phan Thiết, Tuy Hòa, and U.S. installations at Bong Son and An Khê in II Corps; and Cần Thơ and Vĩnh Long in IV Corps. The following day, Biên Hòa, Long Thanh, Bình Dương in III Corps and Kien Hoa, Dinh Tuong, Gò Công, Kiên Giang, Vĩnh Bình, Bến Tre, and Kien Tuong in IV Corps were assaulted. The last attack of the initial operation was launched against Bạc Liêu in IV Corps on 10 February. A total of approximately 84,000 Viet Cong and North Vietnamese troops participated in the attacks while thousands of others stood by to act as reinforcements or as blocking forces. Viet Cong and North Vietnamese forces also mortared or rocketed every major allied airfield and attacked 64 district capitals and scores of smaller towns. In most cases, the defense against the communists was led by the South Vietnamese. Local militia or ARVN forces, supported by the National Police, usually drove the attackers out within two or three days, sometimes within hours; but heavy fighting continued several days longer in Kon Tum, Buôn Ma Thuột, Phan Thiết, Cần Thơ, and Bến Tre. The outcome in each instance was usually dictated by the ability of local commanders—some were outstanding, others were cowardly or incompetent. During this crucial crisis, however, no South Vietnamese unit broke or defected to the communists. According to Westmoreland, he responded to the news of the attacks with optimism, both in media presentations and in his reports to Washington. According to closer observers, however, the General was "stunned that the communists had been able to coordinate so many attacks in such secrecy", and he was "dispirited and deeply shaken." According to Clark Clifford, at the time of the initial attacks, the reaction of the U.S. military leadership "approached panic". 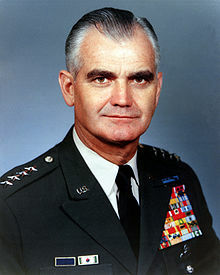 Although Westmoreland's appraisal of the military situation was correct, he made himself look foolish by continuously maintaining his belief that Khe Sanh was the real objective of the North Vietnamese and that 155 attacks by 84,000 troops was a diversion (a position he maintained until at least 12 February). Washington Post reporter Peter Braestrup summed up the feelings of his colleagues by asking "How could any effort against Saigon, especially downtown Saigon, be a diversion?" Although Saigon was the focal point of the offensive, the VC/PAVN did not seek a total takeover of the city. 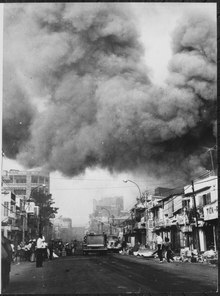 Rather, they had six primary targets to strike in the downtown area: the headquarters of the ARVN Joint General Staff, Tan Son Nhut Air Base, the Independence Palace, the US Embassy in Saigon, the Republic of Vietnam Navy Headquarters, and the National Radio Station. 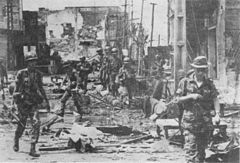 Elsewhere in the city or its outskirts, ten VC Local Force Battalions attacked the central police station and the Artillery Command and the Armored Command headquarters (both at Gò Vấp). The plan called for all these initial forces to capture and hold their positions for 48 hours, by which time reinforcements were to have arrived to relieve them. The defense of the Capital Military District was primarily a South Vietnamese responsibility and it was initially defended by eight ARVN infantry battalions and the local police force. By 3 February they had been reinforced by five ARVN Ranger Battalions, five Marine Corps, and five ARVN Airborne Battalions. U.S. Army units participating in the defense included the 716th Military Police Battalion, seven infantry battalions (one mechanized), and six artillery battalions. At the Armored Command and Artillery Command headquarters on the northern edge of the city the PAVN planned to use captured tanks and artillery pieces but the tanks had been moved to another base two months earlier and the breech blocks of the artillery pieces had been removed, rendering them useless. One of the most important targets, from a symbolic and propagandistic point of view, was the National Radio Station. Its troops had brought along a tape recording of Hồ Chi Minh announcing the liberation of Saigon and calling for a "General Uprising" against the Thiệu government. They seized the building, held it for six hours and, when running out of ammunition, the last eight attackers destroyed it and killed themselves using explosive charges, but they were unable to broadcast due to the cutting off of the audio lines from the main studio to the tower as soon as the station was seized. The US Embassy in Saigon, a massive six-floor building situated within a four-acre compound, had been completed only in September. At 02:45 it was attacked by a 19-man sapper team that blew a hole in the 8-foot-high (2.4 m) surrounding wall and charged through. With their officers killed in the initial attack and their attempt to gain access to the building having failed, the sappers simply occupied the chancery grounds until they were all killed or captured by US reinforcements that were landed on the roof of the building six hours later. By 09:20 the embassy and grounds were secured, with the loss of five US personnel. At 03:00 on 31 January, twelve VC sappers approached the Vietnamese Navy Headquarters in two civilian cars, killing two guards at a barricade at Me Linh Square and then advanced towards the base gate. The sound of gunfire alerted base sentries who secured the gate and sounded the alarm. A .30-caliber machine gun on the second floor of the headquarters disabled both cars and killed or wounded several sappers while the Navy security force organized a counterattack. Simultaneously a U.S. Navy advisor contacted the U.S. military police who soon attacked the Vietcong from adjoining streets, the resulting crossfire ended the attack, killing eight sappers with two captured. Small squads of VC fanned out across the city to attack various officers and enlisted men's billets, homes of ARVN officers, and district police stations. Provided with "blacklists" of military officers and civil servants, they began to round up and execute any that could be found. On 1 February General Nguyễn Ngọc Loan, chief of the National Police, publicly executed VC officer Nguyễn Văn Lém, captured in civilian clothing, in front of photographer Edward T. Adams and a film cameraman. 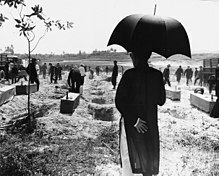 That photography, with the title of Saigon Execution won the 1969 Pulitzer Prize for Spot News Photography and is widely seen as a defining moment in the Vietnam War for its influence on public opinion in the United States about the war, even being called "the picture that lost the war". Outside the city proper two VC battalions attacked the U.S. logistical and headquarters complex at Long Binh Post. Biên Hòa Air Base was struck by a battalion, while the adjacent ARVN III Corps headquarters was the objective of another. Tan Son Nhut Air Base, in the northwestern part of the city, was attacked by three battalions. A combat-ready battalion of ARVN paratroopers, awaiting transport to Da Nang, went instead directly into action supporting the United States Air Force's 377th Security Police Squadron and the US Army's 3rd Squadron, 4th Cavalry Regiment in halting the attack. A total of 35 VC/PAVN battalions, many of whose troops were undercover cadres who had lived and worked within the capital or its environs for years, had been committed to the Saigon objectives. By dawn most of the attacks within the city center had been eliminated, but severe fighting between VC and allied forces erupted in the Chinese neighborhood of Cholon around the Phú Thọ racetrack, southwest of the city center, which was being used as a staging area and command and control center by the VC/PAVN. Bitter and destructive house-to-house fighting erupted in the area. On 4 February, the residents were ordered to leave their homes and the area was declared a free fire zone. Fighting in the city came to a close only after a fierce battle between the ARVN Rangers and PAVN forces on 7 March. Except at Huế and mopping-up operations in and around Saigon, the first surge of the offensive was over by the second week of February. The U.S. estimated that during the first phase (30 January – 8 April) approximately 45,000 VC/PAVN soldiers were killed and an unknown number were wounded. For years this figure has been held as excessively optimistic, as it represented more than half the forces involved in this battle. Stanley Karnow claims he confirmed this figure in Hanoi in 1981. Westmoreland himself claimed a smaller number of enemies disabled, estimating that during the same period 32,000 PAVN troops were killed and another 5,800 captured. The South Vietnamese suffered 2,788 killed, 8,299 wounded, and 587 missing in action. U.S. and other allied forces suffered 1,536 killed, 7,764 wounded, and 11 missing. At 03:40 on the foggy morning of 31 January, allied defensive positions north of the Perfume River in the city of Huế were mortared and rocketed and then attacked by two battalions of the 6th PAVN Regiment. Their target was the ARVN 1st Division headquarters located in the Citadel, a three-square mile complex of palaces, parks, and residences, which were surrounded by a moat and a massive earth and masonry fortress built at the beginning of the 19th century by Emperor Gia Long. The undermanned ARVN defenders, led by General Ngô Quang Trưởng, managed to hold their position, but the majority of the Citadel fell to the PAVN. On the south bank of the river, the 4th PAVN Regiment attempted to seize the local MACV headquarters, but was held at bay by a makeshift force of approximately 200 Americans. The rest of the city was overrun by PAVN forces which initially totaled approximately 7,500 men. Both sides then rushed to reinforce and resupply their forces. Lasting 25 days, the battle of Huế became one of the longest and bloodiest single battles of the Vietnam War. During the first days of the North Vietnamese occupation, U.S. intelligence vastly underestimated the number of PAVN troops and little appreciated the effort that was going to be necessary to evict them. General Westmoreland informed the Joint Chiefs that "the enemy has approximately three companies in the Huế Citadel and the marines have sent a battalion into the area to clear them out." A later assessment ultimately noted three Marine and 11 Vietnamese battalions engaged at least 8 NVA/VC battalions of the 6th NVA Regiment, not including the large number of forces outside the city. Since there were no U.S. formations stationed in Huế, relief forces had to move up from Phu Bai, eight kilometers to the southeast. In a misty drizzle, U.S. Marines of the 1st Marine Division and soldiers of the 1st ARVN Division and Marine Corps cleared the city street by street and house by house, a deadly and destructive form of urban combat that the U.S. military had not engaged in since the Battle of Seoul during the Korean War, and for which neither side were trained. Because of poor weather conditions, logistics problems and the historical and cultural significance of the city, American forces did not immediately apply air and artillery strikes as widely as they had in other cities. Viet Cong forces around Hue included six main-force battalions, while two PAVN regiments operated in the area. As the battle unfolded three more PAVN regiments redeployed from Khe Sanh arrived as reinforcements. The North Vietnamese plan of attack on Hue involved intensive preparation and reconnaissance. Over 190 targets, including every government and military installation on both sides of the river would be hit on January 31 by a force of five thousand. Other forces would block American and ARVN reinforcement routes, mainly Highway 1. Over half of the ARVN 1st Division was on holiday leave and PAVN commanders believed the population of Hue would join the fight as a part of the General Uprising. Outside Huế, elements of the U.S. 1st Air Cavalry Division and the 101st Airborne Division fought to seal PAVN access and cut off their lines of supply and reinforcement. By this point in the battle 16 to 18 PAVN battalions (8,000-11,000 men) were taking part in the fighting for the city itself or the approaches to the former imperial capital. Two of the North Vietnamese regiments had made a forced march from the vicinity of Khe Sanh to Huế in order to participate. During most of February, the allies gradually fought their way towards the Citadel, which was only taken after twenty-five days of intense struggle. 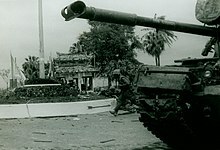 The city was not declared recaptured by U.S. and ARVN forces until 25 February, when members of the 2nd Battalion, 3rd Regiment, 1st ARVN Division raised the South Vietnamese flag over the Palace of Perfect Peace. During the intense action, the allies estimated that North Vietnamese forces had between 1,042 and 5,000 killed and 89 captured in the city and in the surrounding area. 216 U.S. Marines and soldiers had been killed during the fighting and 1,609 were wounded. 421 ARVN troops were killed, another 2,123 were wounded, and 31 were missing. More than 5,800 civilians had lost their lives during the battle and 116,000 were left homeless out of an original population of 140,000. 40-50% of Huế was destroyed by the end of the battle. In the aftermath of the recapture of the city, the discovery of several mass graves (the last of which were uncovered in 1970) of South Vietnamese citizens of Huế sparked a controversy that has not diminished with time. The victims had either been clubbed or shot to death or simply buried alive. 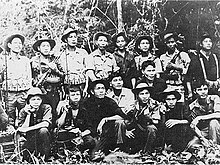 The official allied explanation was that during their initial occupation of the city, the PAVN had quickly begun to systematically round up (under the guise of re-education) and then execute as many as 2,800 South Vietnamese civilians that they believed to be potentially hostile to communist control. Those taken into custody included South Vietnamese military personnel, present and former government officials, local civil servants, teachers, policemen, and religious figures. Historian Gunther Lewy claimed that a captured Viet Cong document stated that the communists had "eliminated 1,892 administrative personnel, 38 policemen, 790 tyrants." The North Vietnamese officer, Bùi Tín, later further muddied the waters by stating that their forces had indeed rounded up "reactionary" captives for transport to the North, but that local commanders, under battlefield exigencies, had executed them for expediency's sake. General Ngô Quang Trưởng, commander of the 1st ARVN Division, believed that the captives had been executed by the communists in order to protect the identities of members of the local Viet Cong infrastructure, whose covers had been blown. The exact circumstances leading to the deaths of those citizens of Huế discovered in the mass graves may never be known exactly, but most of the victims were killed as a result of PAVN and NLF executions, considering evidence from captured documents and witness testimonies among other things. The attack on Khe Sanh, which began on 21 January before the other offensives, probably served two purposes—as a real attempt to seize the position or as a diversion to draw American attention and forces away from the population centers in the lowlands, a deception that was "both plausible and easy to orchestrate." In General Westmoreland's view, the purpose of the Combat Base was to provoke the North Vietnamese into a focused and prolonged confrontation in a confined geographic area, one which would allow the application of massive U.S. artillery and air strikes that would inflict heavy casualties in a relatively unpopulated region. By the end of 1967, MACV had moved nearly half of its manoeuvre battalions to I Corps in anticipation of just such a battle. Westmoreland—and the American media, which covered the action extensively—often made inevitable comparisons between the actions at Khe Sanh and the Battle of Điện Biên Phủ, where a French base had been besieged and ultimately overrun by Viet Minh forces under the command of General Giáp during the First Indochina War. Westmoreland, who knew of Nguyen Chi Thanh's penchant for large-scale operations—but not of his death—believed that this was going to be an attempt to replicate that victory. He intended to stage his own "Dien Bien Phu in reverse." Khe Sanh and its 6,000 U.S. Marine Corps, Army, and ARVN defenders was surrounded by two to three North Vietnamese divisions, totaling approximately 20,000 men. Throughout the siege, which lasted until 8 April, the allies were subjected to heavy mortar, rocket, and artillery bombardment, combined with sporadic small-scale infantry attacks on outlying positions. With the exception of the overrunning of the U.S. Special Forces camp at Lang Vei, however, there was never a major ground assault on the base and the battle became largely a duel between American and North Vietnamese artillerists, combined with massive air strikes conducted by U.S. aircraft. By the end of the siege, U.S. Air Force, Marine Corps, and Navy aircraft had dropped 39,179 tons of ordnance in the defense of the base. The overland supply route to the base had been cut off, and airborne resupply by cargo aircraft became extremely dangerous due to heavy North Vietnamese antiaircraft fire. Thanks to innovative high-speed "Super Gaggles", which utilized fighter-bombers in combination with large numbers of supply helicopters, and the Air Force's utilization of C-130 Hercules cargo aircraft employing the innovative LAPES delivery method, aerial resupply was never halted. When the Tet Offensive began, feelings ran high at MACV that the base was in for a serious attack. In I Corps, the Tet Truce had been cancelled in apprehension of a communist assault that never happened. The offensive passed Khe Sanh by and the intermittent battle continued. Westmoreland's fixation upon the base continued even as the battle raged around him in Saigon. On 1 February, as the offensive reached its height, he wrote a memo for his staff—which was never delivered—stating: "The enemy is attempting to confuse the issue ... I suspect he is also trying to draw everyone's attention from the area of greatest threat, the northern part of I Corps. Let me caution everyone not to be confused." In the end, a major allied relief expedition (Operation Pegasus) launched by all three brigades of the First Cavalry Division reached Khe Sanh on 8 April, but North Vietnamese forces were already withdrawing from the area. Both sides claimed that the battle had served its intended purpose. The MACV estimated that 5,500 North Vietnamese troops had been killed and considerably more wounded. During Operation Pegasus, 730 American lives lost and another 2,642 wounded. Khe Sanh Base was later closed on 5 July 1968 because the base was seen as having less of a strategic importance than before. To further enhance their political posture at the Paris talks, which opened on 13 May, the North Vietnamese opened the second phase of the General Offensive in late April. U.S. intelligence sources estimated between February and May the North Vietnamese dispatched 50,000 men down the Ho Chi Minh Trail to replace losses incurred during the earlier fighting. 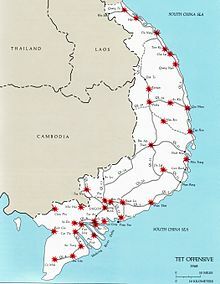 Some of the most prolonged and vicious combat of the war opened on 29 April and lasted until 30 May when the 8,000 men of the 320th PAVN Division, backed by artillery from across the DMZ, threatened the U.S. logistical base at Đông Hà, in northwestern Quảng Trị Province. In what became known as the Battle of Dai Do, the North Vietnamese clashed savagely with U.S. Marine, Army, and ARVN forces before withdrawing. The North Vietnamese lost an estimated 2,100 men according to US/ARVN claims, after inflicting casualties on the allies of 290 killed and 946 wounded. During the early morning hours of 4 May, communist units initiated the second phase of the offensive (known by the South Vietnamese and Americans as "Mini-Tet") by striking 119 targets throughout South Vietnam, including Saigon. This time, however, allied intelligence was better prepared, stripping away the element of surprise. Most of the communist forces were intercepted by allied screening elements before they reached their targets. 13 Viet Cong battalions, however, managed to slip through the cordon and once again plunged the capital into chaos. Severe fighting occurred at Phu Lam, (where it took two days to root out the 267th Viet Cong Local Force Battalion), around the Y-Bridge, and at Tan Son Nhut. By 12 May, however, it was all over. Viet Cong forces withdrew from the area leaving behind over 3,000 dead. The fighting had no sooner died down around Saigon than U.S. forces in Quảng Tín Province suffered a defeat when the 2nd PAVN Division attacked Kham Duc, the last Special Forces border surveillance camp in I Corps. 1,800 U.S. and South Vietnamese troops were isolated and under intense attack when MACV made the decision to avoid a situation reminiscent of that at Khe Sanh. Kham Duc was evacuated by air while under fire, and abandoned to the North Vietnamese. Phase III of the offensive began on 17 August and involved attacks in I, II, and III Corps. Significantly, during this series of actions only North Vietnamese forces participated and targets were military in nature, with less concise attacks against city-targets. The main offensive was preceded by attacks on the border towns of Tây Ninh, An Lộc, and Loc Ninh, which were initiated in order to draw defensive forces from the cities. A thrust against Da Nang was preempted by the U.S. Marines' Operation Allen Brook. Continuing their border-clearing operations, three North Vietnamese regiments asserted heavy pressure on the U.S. Special Forces camp at Bu Prang, in Quang Duc Province, five kilometers from the Cambodian border. The fighting lasted for two days before the North Vietnamese broke it off; the combat resulted in US/ARVN claiming 776 NLF/PAVN casualties, 114 South Vietnamese, and two Americans. Saigon was struck again during this phase, but the attacks were less sustained and once again repulsed. As far as MACV was concerned, the August offensive "was a dismal failure". In five weeks of fighting and after the loss of 20,000 troops, the previous objectives of spurring an uprising and mass-defection had not been attained during this "final and decisive phase". Yet, as historian Ronald Spector has pointed out "the communist failures were not final or decisive either". The horrendous casualties and suffering endured by communist units during these sustained operations were beginning to tell. The fact that there were no apparent military gains made that could possibly justify all the blood and effort just exacerbated the situation. During the first half of 1969, more than 20,000 communist troops rallied to allied forces, a threefold increase over the 1968 figure. The leadership in Hanoi was despondent at the outcome of their offensive. Their first and most ambitious goal, producing a general uprising, had ended in a dismal failure. In total, about 85,000–100,000 communist troops had participated in the initial onslaught and in the follow-up phases. Overall, during the "Border Battles" of 1967 and the nine-month winter-spring campaign, 45,267 communist troops had been killed in action. Hanoi had underestimated the strategic mobility of the allied forces, which allowed them to redeploy at will to threatened areas; their battle plan was too complex and difficult to coordinate, which was amply demonstrated by the 30 January attacks; their violation of the principle of mass, attacking everywhere instead of concentrating their forces on a few specific targets, allowed their forces to be defeated piecemeal; the launching of massed attacks headlong into the teeth of vastly superior firepower; and last, but not least, the incorrect assumptions upon which the entire campaign was based. According to General Tran Van Tra: "We did not correctly evaluate the specific balance of forces between ourselves and the enemy, did not fully realize that the enemy still had considerable capabilities, and that our capabilities were limited, and set requirements that were beyond our actual strength. A Viet Cong guerrilla awaits interrogation following his capture in the attacks on Saigon. The communist effort to regain control of the countryside was somewhat more successful. According to the U.S. State Department the Viet Cong "made pacification virtually inoperative. In the Mekong Delta the Viet Cong was stronger now than ever and in other regions the countryside belongs to the VC." General Wheeler reported that the offensive had brought counterinsurgency programs to a halt and "that to a large extent, the V.C. now controlled the countryside". Unfortunately for the Viet Cong, this state of affairs did not last. Heavy casualties and the backlash of the South Vietnamese and Americans resulted in more territorial losses and heavy casualties. The heavy losses inflicted on Viet Cong units struck into the heart of the infrastructure that had been built up for over a decade. MACV estimated that 181,149 Viet Cong and North Vietnamese troops had been killed during 1968. According to General Tran Van Tra, 45,267 NLF/NVA troops had been killed during 1968 From this point forward, Hanoi was forced to fill one-third of the Viet Cong's ranks with North Vietnamese regulars. However, this change had little effect on the war, since North Vietnam had little difficulty making up the casualties inflicted by the offensive. Some Western historians have come to believe that one insidious ulterior motive for the campaign was the elimination of competing southern members of the Party, thereby allowing the northerners more control once the war was won. In all honesty, we didn't achieve our main objective, which was to spur uprisings throughout the South. Still, we inflicted heavy casualties on the Americans and their puppets, and this was a big gain for us. As for making an impact in the United States, it had not been our intention—but it turned out to be a fortunate result. On 5 May Trường Chinh rose to address a congress of Party members and proceeded to castigate the Party militants and their bid for quick victory. His "faction-bashing" tirade sparked a serious debate within the party leadership which lasted for four months. As the leader of the "main force war" and "quick victory" faction, Lê Duẩn also came under severe criticism. In August, Chinh's report on the situation was accepted in toto, published, and broadcast via Radio Hanoi. He had single-handedly shifted the nation's war strategy and restored himself to prominence as the Party's ideological conscience. Meanwhile, the Viet Cong proclaimed itself the Provisional Revolutionary Government of the Republic of South Vietnam, and took part in future peace negotiations under this title. The Lê Duẩn-Hoàng Văn Thái faction, which favoured quick, decisive offensives meant to paralyse South Vietnam-United States responses, was replaced by Giáp and Trường Chinh, who favoured a strategy of more protracted, drawn-out conventional warfare. High-intensity, conventional big-unit battles were replaced with smaller-scale, quick attack and quick withdrawal operations to continually put pressure on the ARVN/US Forces at the same time that mechanised and combined-arms capabilities were being built. The plan for a popular uprising or people's war was abandoned for a greater combination of guerrilla and conventional warfare. During this period, the PAVN would undergo a significant strategic re-structuring, being built into a combined-arms capable force while continually applying pressure on the US/ARVN with lighter infantry units. In line with the revamped strategy of Hanoi, on April 5, 1969, COSVN issued Directive 55 to all of its subordinate units: "Never again and under no circumstances are we going to risk our entire military force for just such an offensive. On the contrary, we should endeavor to preserve our military potential for future campaigns." South Vietnam was a nation in turmoil both during and in the aftermath of the offensive. Tragedy had compounded tragedy as the conflict reached into the nation's cities for the first time. As government troops pulled back to defend the urban areas, the Viet Cong moved in to fill the vacuum in the countryside. The violence and destruction witnessed during the offensive left a deep psychological scar on the South Vietnamese civilian population. Confidence in the government was shaken, since the offensive seemed to reveal that even with massive American support, the government could not protect its citizens. The human and material cost to South Vietnam was staggering. The number of civilian dead was estimated by the government at 14,300 with an additional 24,000 wounded. 630,000 new refugees had been generated, joining the nearly 800,000 others already displaced by the war. By the end of 1968, one of every twelve South Vietnamese was living in a refugee camp. More than 70,000 homes had been destroyed in the fighting and perhaps 30,000 more were heavily damaged and the nation's infrastructure had been virtually destroyed. The South Vietnamese military, although it had performed better than the Americans had expected, suffered from lowered morale, with desertion rates rising from 10.5 per thousand before Tet to 16.5 per thousand by July. 1968 became the deadliest year of the war to date for the ARVN with 27,915 men killed. In Long An province, for example, local guerrillas taking part in the May—June offensive had been divided into several sections. Only 775 out of 2,018 in one section survived; another lost all but 640 out of 1,430. The province itself was subjected to what one historian has called a "My Lai from the Sky" – non-stop B-52 bombing. In the wake of the offensive, however, fresh determination was exhibited by the Thiệu government. On 1 February Thiệu declared a state of martial law, and on 15 June, the National Assembly passed his request for a general mobilization of the population and the induction of 200,000 draftees into the armed forces by the end of the year (a decree that had failed to pass only five months previously due to strong political opposition). This increase would bring South Vietnam's troop strength to more than 900,000 men. Military mobilization, anti-corruption campaigns, demonstrations of political unity, and administrative reforms were quickly carried out. Thiệu also established a National Recovery Committee to oversee food distribution, resettlement, and housing construction for the new refugees. Both the government and the Americans were encouraged by a new determination that was exhibited among the ordinary citizens of the Republic. 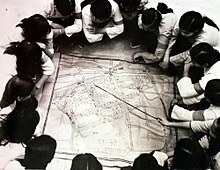 Many urban dwellers were indignant that the communists had launched their attacks during Tet, and it drove many who had been previously apathetic into active support of the government. Journalists, political figures, and religious leaders alike—even the militant Buddhists—professed confidence in the government's plans. Thiệu saw an opportunity to consolidate his personal power and he took it. His only real political rival was Vice President Kỳ, the former Air Force commander, who had been outmaneuvered by Thiệu in the presidential election of 1967. In the aftermath of Tet, Kỳ supporters in the military and the administration were quickly removed from power, arrested, or exiled. A crack-down on the South Vietnamese press also ensued and there was a worrisome return of former President Ngô Đình Diệm's Cần Lao Party members to high positions in the government and military. By the summer of 1968, the President had earned a less exalted sobriquet among the South Vietnamese population, who had begun to call him "the little dictator." 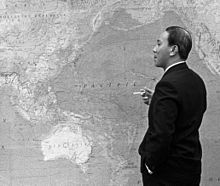 Thiệu had also become very suspicious of his American allies, unwilling to believe (as did many South Vietnamese) that the U.S. had been caught by surprise by the offensive. "Now that it's all over", he queried a visiting Washington official, "you really knew it was coming, didn't you?" Lyndon Johnson's unilateral decision on 31 March to curtail the bombing of North Vietnam only confirmed what Thiệu already feared, that the Americans were going to abandon South Vietnam to the communists. For Thiệu, the bombing halt and the beginning of negotiations with the North brought not the hope of an end to the war, but "an abiding fear of peace." He was only mollified after an 18 July meeting with Johnson in Honolulu, where the American president affirmed that Saigon would be a full partner in all negotiations and that the U.S. would not "support the imposition of a coalition government, or any other form of government, on the people of South Vietnam." The Tet Offensive created a crisis within the Johnson administration, which became increasingly unable to convince the American public that it had been a major defeat for the communists. The optimistic assessments made prior to the offensive by the administration and the Pentagon came under heavy criticism and ridicule as the "credibility gap" that had opened in 1967 widened into a chasm. At the time of the Tet Offensive, the majority of the American public perceived that the war was not being won by the United States and its allies, despite assurances from the President and military leaders that such was the case. No matter that the North Vietnamese and their NLF allies lost about 30,000 of their best troops in the fighting at Tet, they were capable of replacing those lost with new recruits from North Vietnam. In 1969, the year after the Tet battles, the US suffered 11,780 killed, the second highest annual total in the war. This was a clear indication that the North Vietnamese were capable of ongoing offensive actions, despite their losses at Tet. Most Americans were tired of suffering so many casualties without evidence that they were going to stop anytime in the foreseeable future. Walter Cronkite, anchorman of the CBS Evening News and a World War II combat veteran, argued for negotiations as an honorable way out in a Special Report based on his journalism in Vietnam broadcast on CBS TV in March. The shocks that reverberated from the battlefield continued to widen: On 18 February 1968 MACV posted the highest U.S. casualty figures for a single week during the entire war: 543 killed and 2,547 wounded. As a result of the heavy fighting, 1968 went on to become the deadliest year of the war for the US forces with 16,592 soldiers killed. On 23 February the U.S. Selective Service System announced a new draft call for 48,000 men, the second highest of the war. On 28 February Robert S. McNamara, the Secretary of Defense who had overseen the escalation of the war in 1964–1965, but who had eventually turned against it, stepped down from office. During the first two weeks of February, Generals Westmoreland and Wheeler communicated as to the necessity for reinforcements or troop increases in Vietnam. Westmoreland insisted that he only needed those forces either in-country or already scheduled for deployment and he was puzzled by the sense of unwarranted urgency in Wheeler's queries. Westmoreland was tempted, however, when Wheeler emphasized that the White House might loosen restraints and allow operations in Laos, Cambodia, or possibly even North Vietnam itself. On 8 February, Westmoreland responded that he could use another division "if operations in Laos are authorized". Wheeler responded by challenging Westmoreland's assessment of the situation, pointing out dangers that his on-the-spot commander did not consider palpable, concluding: "In summary, if you need more troops, ask for them." Wheeler's promptings were influenced by the severe strain imposed upon the U.S. military by the Vietnam commitment, one which had been undertaken without the mobilization of its reserve forces. The Joint Chiefs had repeatedly requested national mobilization, not only to prepare for a possible intensification of the war, but also to ensure that the nation's strategic reserve did not become depleted. By obliquely ordering Westmoreland to demand more forces, Wheeler was attempting to solve two pressing problems. In comparison with MACV's previous communications, which had been full of confidence, optimism, and resolve, Westmoreland's 12 February request for 10,500 troops was much more urgent: "which I desperately need ... time is of the essence". On 13 February, 10,500 previously authorized U.S. airborne troops and marines were dispatched to South Vietnam. The Joint Chiefs then played their hand, advising President Johnson to turn down MACV's requested division-sized reinforcement unless he called up some 1,234,001 marine and army reservists. Johnson dispatched Wheeler to Saigon on 20 February to determine military requirements in response to the offensive. Both Wheeler and Westmoreland were elated that in only eight days McNamara would be replaced by the hawkish Clark Clifford and that the military might finally obtain permission to widen the war. Wheeler's written report of the trip, however, contained no mention of any new contingencies, strategies, or the building up the strategic reserve. It was couched in grave language that suggested that the 206,756-man request it proposed was a matter of vital military necessity. Westmoreland wrote in his memoir that Wheeler had deliberately concealed the truth of the matter in order to force the issue of the strategic reserve upon the President. On 27 February, Johnson and McNamara discussed the proposed troop increase. To fulfill it would require an increase in overall military strength of about 400,000 men and the expenditure of an additional $10 billion during fiscal 1969 and another $15 billion in 1970. These monetary concerns were pressing. Throughout the fall of 1967 and the spring of 1968, the U.S. was struggling with "one of the most severe monetary crises" of the period. Without a new tax bill and budgetary cuts, the nation would face even higher inflation "and the possible collapse of the monetary system". Johnson's friend Clifford was concerned about what the American public would think of the escalation: "How do we avoid creating the feeling that we are pounding troops down a rathole?" According to the Pentagon Papers, "A fork in the road had been reached and the alternatives stood out in stark reality." To meet Wheeler's request would mean a total U.S. military commitment to South Vietnam. "To deny it, or to attempt to cut it to a size which could be sustained by the thinly stretched active forces, would just as surely signify that an upper limit to the U.S. military commitment in South Vietnam had been reached." To evaluate Westmoreland's request and its possible impact on domestic politics, Johnson convened the "Clifford Group" on 28 February and tasked its members with a complete policy reassessment. Some of the members argued that the offensive represented an opportunity to defeat the North Vietnamese on American terms while others pointed out that neither side could win militarily, that North Vietnam could match any troop increase, that the bombing of the North be halted, and that a change in strategy was required that would seek not victory, but the staying power required to reach a negotiated settlement. This would require a less aggressive strategy that was designed to protect the population of South Vietnam. The divided group's final report, issued on 4 March, "failed to seize the opportunity to change directions... and seemed to recommend that we continue rather haltingly down the same road." On 1 March, Clifford had succeeded McNamara as Secretary of Defense. During the month, Clifford, who had entered office as a staunch supporter of the Vietnam commitment and who had opposed McNamara's de-escalatory views, turned against the war. According to Clifford: "The simple truth was that the military failed to sustain a respectable argument for their position." Between the results of Tet and the meetings of the group that bore his name, he became convinced that deescalation was the only solution for the United States. He believed that the troop increase would lead only to a more violent stalemate and sought out others in the administration to assist him in convincing the President to reverse the escalation, to cap force levels at 550,000 men, to seek negotiations with Hanoi, and turn responsibility for the fighting over to the South Vietnamese. Clifford quietly sought allies and was assisted in his effort by the so-called "8:30 Group" – Nitze, Warnke, Phil G. Goulding (Assistant Secretary of Defense for Public Affairs), George Elsey, and Air Force Colonel Robert E. Pursely. On 27 February, Secretary of State Dean Rusk had proposed that a partial bombing halt be implemented in North Vietnam and that an offer to negotiate be extended to Hanoi. On 4 March, Rusk reiterated the proposal, explaining that, during the rainy season in the North, bombing was less effective and that no military sacrifice would thus occur. This was purely a political ploy, however, since the North Vietnamese would probably again refuse to negotiate, casting the onus on them and "thus freeing our hand after a short period...putting the monkey firmly upon Hanoi's back for what was to follow." While this was being deliberated, the troop request was leaked to the press and published in The New York Times on 10 March. The article also revealed that the request had begun a serious debate within the administration. According to it, many high-level officials believed that the U.S. troop increase would be matched by the communists and would simply maintain a stalemate at a higher level of violence. It went on to state that officials were saying in private that "widespread and deep changes in attitudes, a sense that a watershed has been reached." A great deal has been said by historians concerning how the news media made Tet the "turning point" in the public's perception of the war. Popular CBS anchor Walter Cronkite stated during a news broadcast on February 27, "We have been too often disappointed by the optimism of the American leaders, both in Vietnam and Washington, to have faith any longer in the silver linings they find in the darkest clouds" and added that, "we are mired in a stalemate that could only be ended by negotiation, not victory." Far from suffering a loss of morale, however, the majority of Americans had rallied to the side of the president. A Gallup poll in January 1968 revealed that 56 percent polled considered themselves hawks on the war and 27 percent doves, with 17 percent offering no opinion. By early February, at the height of the first phase of the offensive, 61 percent declared themselves hawks, 23 percent doves, and 16 percent held no opinion. Johnson, however, made few comments to the press during or immediately after the offensive, leaving an impression of indecision on the public. It was this lack of communication that caused a rising disapproval rating for his conduct of the war. By the end of February, his approval rating had fallen from 63 percent to 47 percent. By the end of March the percentage of Americans that expressed confidence in U.S. military policies in Southeast Asia had fallen from 74 to 54 percent. By 22 March, President Johnson had informed Wheeler to "forget the 100,000" men. The President and his staff were refining a lesser version of the troop increase – a planned call-up of 62,000 reservists, 13,000 of whom would be sent to Vietnam. Three days later, at Clifford's suggestion, Johnson called a conclave of the "Wise Men". With few exceptions, all of the members of the group had formerly been accounted as hawks on the war. The group was joined by Rusk, Wheeler, Bundy, Rostow, and Clifford. The final assessment of the majority stupefied the group. According to Clifford, "few of them were thinking solely of Vietnam anymore". All but four members called for disengagement from the war, leaving the President "deeply shaken." According to the Pentagon Papers, the advice of the group was decisive in convincing Johnson to reduce the bombing of North Vietnam. Lyndon Johnson was depressed and despondent at the course of recent events. The New York Times article had been released just two days before the Democratic Party's New Hampshire primary, where the President suffered an unexpected setback in the election, finishing barely ahead of Senator Eugene McCarthy. Soon afterward, Senator Robert F. Kennedy announced he would join the contest for the Democratic nomination, further emphasizing the plummeting support for Johnson's administration in the wake of Tet. The President was to make a televised address to the nation on Vietnam policy on 31 March and was deliberating on both the troop request and his response to the military situation. By 28 March Clifford was working hard to convince him to tone down his hard-line speech, maintaining force levels at their present size, and instituting Rusk's bombing/negotiating proposal. To Clifford's surprise, both Rusk and Rostow (both of whom had previously been opposed to any form of deescalation) offered no opposition to Clifford's suggestions. On 31 March, President Johnson announced the unilateral (although still partial) bombing halt during his television address. He then stunned the nation by declining to run for a second term in office. To Washington's surprise, on 3 April Hanoi announced that it would conduct negotiations, which were scheduled to begin on 13 May in Paris. On 9 June, President Johnson replaced Westmoreland as commander of MACV with General Creighton W. Abrams. Although the decision had been made in December 1967 and Westmoreland was made Army Chief of Staff, many saw his relief as punishment for the entire Tet debacle. Abrams' new strategy was quickly demonstrated by the closure of the "strategic" Khe Sanh base and the ending of multi-division "search and destroy" operations. Also gone were discussions of victory over North Vietnam. Abrams' new "One War" policy centered the American effort on the takeover of the fighting by the South Vietnamese (through Vietnamization), the pacification of the countryside, and the destruction of communist logistics. The new administration of President Richard M. Nixon would oversee the withdrawal of U.S. forces and the continuation of negotiations. The second half of Stanley Kubrick's 1987 film Full Metal Jacket takes place during the Tet Offensive, mostly in and around Huế. ^ "Tet Offensive". History. Retrieved December 22, 2014. ^ The South Vietnamese regime estimated North Vietnamese forces at 323,000, including 130,000 regulars and 160,000 guerrillas. Hoang, p. 10. MACV estimated that strength at 330,000. The CIA and the U.S. State Department concluded that the North Vietnamese force level lay somewhere between 435,000 and 595,000. Dougan and Weiss, p. 184. ^ Does not include ARVN or U.S. casualties incurred during the "Border Battles"; ARVN killed, wounded, or missing from Phase III; U.S. wounded from Phase III; or U.S. missing during Phases II and III. ^ Includes casualties incurred during the "Border Battles", Tet Mau Than, and the second and third phases of the offensive. General Tran Van Tra claimed that from January through August 1968 the offensive had cost North Vietnam more than 75,000 dead and wounded. This is probably a low estimate. Tran Van Tra, Tet, in Jayne S. Warner and Luu Doan Huynh, eds., The Vietnam War: Vietnamese and American Perspectives. Armonk NY: M.E. Sharpe, 1993, pgs. 49 & 50. ^ "Tết Mậu Thân 1968 qua những số liệu - Báo Nhân Dân điện tử". Tết Mậu Thân 1968 qua những số liệu - Báo Nhân Dân điện tử. Retrieved March 3, 2019. ^ Ang, p. 351. Two interpretations of North Vietnamese goals have continued to dominate Western historical debate. The first maintained that the political consequences of the winter-spring offensive were an intended rather than an unintended consequence. This view was supported by William Westmoreland and his friend Jamie Salt in A Soldier Reports, Garden City NY: Doubleday, 1976, p. 322; Harry G. Summers in On Strategy, Novato CA: Presidio Press, 1982, p. 133; Leslie Gelb and Richard Betts, The Irony of Vietnam, Washington, D.C.: The Brookings Institution, 1979, pp. 333–334; and Schmitz p. 90. This thesis appeared logical in hindsight, but it "fails to account for any realistic North Vietnamese military objectives, the logical prerequisite for an effort to influence American opinion." James J. Wirtz in The Tet Offensive, Ithaca NY: Cornell University Press, 1991, p. 18. The second thesis (which was also supported by the majority of contemporary captured Vietcong documents) was that the goal of the offensive was the immediate toppling of the Saigon government or, at the very least, the destruction of the government apparatus, the installation of a coalition government, or the occupation of large tracts of South Vietnamese territory. Historians supporting this view are Stanley Karnow in Vietnam, New York: Viking, 1983, p. 537; U.S. Grant Sharp in Strategy for Defeat, San Rafael CA: Presidio Press, 1978, p. 214; Patrick McGarvey in Visions of Victory, Stanford CA: Stanford University Press, 1969; and Wirtz, p. 60. ^ "U.S. Involvement in the Vietnam War: The Tet Offensive, 1968". United States Department of State. Retrieved December 29, 2014. ^ a b Dougan and Weiss, p. 8. ^ "Tet Offensive". www.u-s-history.com. Retrieved March 3, 2019. ^ a b Dougan and Weiss, p. 22. ^ Dougan and Weiss, p. 23. ^ Hammond, pp. 326, 327. ^ Dougan and Weiss, p. 23. This Order of Battle controversy resurfaced in 1982 when Westmoreland filed a lawsuit against CBS News after the airing of its program, The Uncounted Enemy: A Vietnam Deception, which aired had on 23 January 1982. ^ Those in the administration and the military who urged a change in strategy included: Secretary of Defense Robert S. McNamara; Undersecretary of State Nicholas Katzenbach; Assistant Secretary for Far Eastern Affairs William Bundy; Ambassador to South Vietnam Henry Cabot Lodge; General Creighton W. Abrams, deputy commander of MACV; and Lieutenant General Frederick C. Weyand, commander of II Field Force, Vietnam. Lewis Sorley, A Better War. New York: Harvest Books, 1999, p. 6. Throughout the year, the Pentagon Papers claimed, Johnson had discounted any "negative analysis" of U.S. strategy by the CIA and the Pentagon offices of International Security Affairs and System Analysis, and had instead "seized upon optimistic reports from General Westmoreland." Neil Sheehan, et al. The Pentagon Papers as Reported by the New York Times. New York: Ballantine, 1971, p. 592. ^ Dougan and Weiss, p. 68. ^ a b Dougan and Weiss, p. 66. ^ Dougan and Weiss, p. 69. ^ Dougan and Weiss, p. 67. ^ Nguyen, p. 4.; Duiker, William J. (2002) "Foreword," in Military History Institute of Vietnam Victory in Vietnam: A History of the People's Army of Vietnam, 1954–1975, p. xiv. ^ Nguyen, p. 20. See also Wirtz, pp. 30–50. ^ Doyle, Lipsman and Maitland, p. 55. ^ Contrary to Western belief, Hồ Chí Minh had been sidelined politically since 1963 and took little part in the day-to-day policy decisions of the Politburo or Secretariat. Nguyen, p. 30. ^ Wirtz, pp. 36–40, 47–49. ^ Hoang, pp. 15–16. See also Doyle, Lipsman and Maitland, p. 56. ^ a b Nguyen, p. 24. ^ Victory in Vietnam, p. 371. ^ Doyle, Lipsman and Maitland, p. 56. ^ Nguyen, p. 34. Duiker, p. 288. Also see Doyle, Lipsman and Maitland, p. 56. ^ Marc J. Gilbert & James Wells Hau Nghia Part 3, 2005. http://grunt.space.swri.edu/gilbert3.htm Archived 2005-10-27 at the Wayback Machine. This reference, left over from an earlier editor, is a fine example of just how discerning research has to be. One of the few accurate statements in it is the one quoted above. The rest is inaccurate gibberish. ^ Doyle, Lipsman and Maitland, pp. 58–59. ^ William, Thomas Allison. The Tet Offensive: a brief history with documents. pp. 25. ^ Hoang offered opposing viewpoints (pp. 22–23) while William Duiker (p. 289) and Clark Clifford (p. 475) believed that it was so intended. Stanley Karnow did not (p. 537), while William Westmoreland never even mentioned the prospect in his memoir. A study of North Vietnamese documentation by James Wirtz led him to conclude that Giáp believed that the American people would have to endure two more years of military stalemate (post-offensive) before turning decisively against the war. Wirtz, p. 61. ^ Trần Văn Trà, Tet, p. 40. ^ Victory in Vietnam,, p. 208. See also Doyle, Lipsman and Maitland, The North, p. 46. ^ a b Dougan and Weiss, p. 10. ^ Hayward, The Tet Offensive: Dialogues. ^ Dougan and Weiss, p. 11. ^ Dougan and Weiss, p. 11. The Tet Offensive would later be utilized in a textbook at West Point as an example of "an allied intelligence failure to rank with Pearl Harbor in 1941 or the Ardennes Offensive in 1944." Lieutenant Colonel Dave R. Palmer: Current Readings in Military History. Clifford, p. 460. ^ Moyars Shore, The Battle of Khe Sanh. U.S. Marine Corps Historical Branch, 1969, p. 17. ^ a b Willbanks, p. 16. ^ a b Hoang, p. 9. ^ Maitland and McInerney, pp. 160–183. ^ a b Palmer, pp. 229–233. ^ Dougan and Weiss, p. 124. ^ Dougan and Weiss, p. 12. ^ In their memoirs, both Johnson and Westmoreland stated that they had predicted the offensive. According to Clark Clifford, however, these later claims were rather "self serving". Clark Clifford, with Richard Holbrooke, Counsel to the President. New York: Random House, 1991, pp. 467–468. ^ Hammond, p. 342.; Zaffiri, p. 280. For a treatment of official statements predicting the offensive, see Peter Braestrup. Big Story, New Haven, Connecticut: Yale University Press, 1983, 1:60–77. ^ Laurence, John (2002), The Cat from Hue: a Vietnam War Story, PublicAffairs Press. ^ Oberdorfer, Don (1971) Tet! : The Turning Point in the Vietnam War. Baltimore: The Johns Hopkins University Press. ISBN 0-8018-6703-7. ^ The first attacks may have been launched prematurely due to confusion over a changeover in the calendar date by North Vietnamese units. Hanoi had arbitrarily forwarded the date of the holiday in order to allow its citizens respite from the retaliatory airstrikes that were sure to follow the offensive. Whether this was connected to the mixup over the launch date is unknown. All eight of the attacks were controlled by the North Vietnamese headquarters of Military Region 5. ^ Westmoreland, p. 328. Palmer gave a figure of 70,000, p. 238. ^ a b Westmoreland, p. 332. ^ a b Karnow, p. 549. ^ Zaffiri, p. 283. Clifford, p. 476. ^ a b Willbanks, p. 32. ^ Alvarez, Everett (1983). Vietnam, a television History: Tet Offensive. Public Broadcasting Service. p. Time in video: 6:57. Retrieved January 31, 2015. ^ Sherwood, John (2015). War in the Shallows: U.S. Navy and Coastal and Riverine Warfare in Vietnam 1965-8. Naval History and Heritage Command. p. 284. ISBN 9780945274773. ^ a b Willbanks, p. 36. ^ In the Jaws of History. Bloomington IN: Indiana University Press, 1999. ^ Perlmutter, David D. "Just How Big an Impact Do Pictures of War Have on Public Opinion?". History News Network. Retrieved January 31, 2015. ^ a b Willbanks, p. 39. ^ Oberdorfer, p. 261, See also Palmer, p. 254, and Karnow, p. 534. ^ Department of Defense, CACCF: Combat Area [Southeast Asia] Casualties Current File, as of Nov. 1993, Public Use Version. Washington, D.C.: National Archives, 1993. ^ Willbanks, pp. xxiv, 43. ^ a b Willbanks, p. 44. ^ Palmer, p. 245. These units included the 12th Viet Cong Main Force Battalion and the Huế City Sapper Battalion. ^ a b Willbanks, James H. (January 25, 2011). "Tet - What Really Happened at Hue". historynet.com. Retrieved December 22, 2014. ^ Schulimson, et al., p. 175. For a detailed description of U.S. participation in the battle, see Keith W. Nolan, Battle for Huế, Tet 1968. Novato CA: Presidio Press, 1983. ^ Dougan and Weiss, p. 28. ^ William, Thomas Allison, pp.51. ^ a b Schulimson, p. 213. ^ Schulimson, p. 213. A PAVN document allegedly captured by the ARVN stated that 1,042 troops had been killed in the city proper and that several times that number had been wounded. Hoang, p. 84. ^ Tucker, Spencer (2011). The Encyclopedia of the Vietnam War: Political, Social, Military History. ABC-CLIO. p. 515. ISBN 1851099611. ^ Wiest, Andrew (2009). The Vietnam War. Rosen Publishing. p. 42. ISBN 1404218459. ^ a b c Willbanks, pp. 99–103. ^ a b Willbanks, p. 55. ^ Dougan and Weiss, p. 35. This was the version given in Douglas Pike's The Viet Cong Strategy of Terror, published by the U.S. Mission in 1970. ^ Stephen T. Hosmer, Viet Cong Repression and its Implications for the Future (Rand Corporation, 1970), pp. 72-8. ^ Karnow, p. 555, John Prados, The Blood Road, New York: John Wiley & Sons, 1998, p. 242. ^ Prados and Stubbe, p. 186. ^ Prados and Stubbe, p. 454. 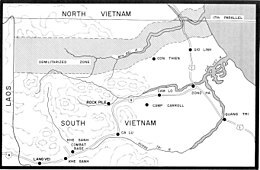 ^ Pike, COL Thomas F., Military Records, February 1968, 3rd Marine Division: The Tet Offensive, p. 205–208, ISBN 978-1-481219-46-4. The Joint Chiefs of Staff created a Top Secret assessment on whether to maintain the Khe Sanh Combat Base or not. ^ Dougan and Weiss, p. 145. ^ Schulimson, p. 307. Perhaps more indicative of North Vietnamese losses were the 41 North Vietnamese prisoners taken and the recovery of 500 weapons, 132 of which were crew-served. Ibid. For a detailed description of the battle, see Keith William Nolan, The Magnificent Bastards: The Joint Army-Marine Defense of Dong Ha, 1968. New York: Dell, 1994. ^ A vivid description of the participation of four battalions of the U.S. 9th Infantry Division in the fighting in Cholon can be found in Keith Nolan's House to House: Playing the Enemy's Game in Saigon, May 1968. St. Paul MN: Zenith Press, 2006. ^ The best descriptions are found in Ronald H. Spector, After Tet. New York: The Free Press, 1993, pp. 166–175 and Lieutenant Colonel Allen Gropman, Air Power and the Airlift Evacuation of Kham Duc. Washington, D.C.: Office of Air Force History, 1985. ^ a b Hoang, p. 101. ^ a b Spector, p. 240. ^ Doyle, Lipsman and Maitland, pp. 118, 120. ^ a b Tran Van Tra, Tet, pp. 49, 50. ^ To a lesser extent characterised as mere disappointment in the official history (a heavy characterisation for an official history), Duiker, William J. (2002) "Foreword," in Military History Institute of Vietnam Victory in Vietnam: A History of the People's Army of Vietnam, 1954–1975, p. xiv. ^ Tran Van Tra, Vietnam, Washington, D.C.: Foreign Broadcast Information Service, 1983, p. 35. There are some extravagant but largely unfounded stories that Tra was severely punished. For example, "This public criticism of the Hanoi leadership led to Tra's removal from the Politburo and house arrest until his death in April 1994." Tra had never been a member of the Politburo. He was not placed under house arrest, even being allowed to travel abroad to attend a conference on the Vietnam War in 1990. And he was allowed to continue writing and publishing on the history of the war; the People's Army Publishing House released his next book in 1992. ^ Duiker, p. 296. This was mainly due to General Creighton Abrams' new "One War" strategy and the CIA/South Vietnamese Phoenix Program. ^ According to one estimate by late 1968, of a total of 125,000 main force troops in the South, 85,000 were of North Vietnamese origin. Duiker, p. 303. ^ Arnold, p. 91. See also Karnow, 534. ^ Doyle, Lipsman and Maitland, pp. 126–127. ^ Currey, Cecil B. (2005). Victory at Any Cost: The Genius of Viet Nam's Gen. Vo Nguyen Giap. Potomac Books, Inc. pp. 272–273. ISBN 9781574887426. ^ a b Warren, James A. (September 24, 2013). Giap: The General Who Defeated America in Vietnam. St. Martin's Press. pp. 189–190. ISBN 9781137098917. ^ Dougan and Weiss, p. 118. ^ a b Dougan and Weiss, p. 116. ^ Dougan and Weiss, p. 119. ^ Three of the four ARVN corps commanders, for example, were replaced for their dismal performance during the offensive. ^ Dougan and Weiss, p. 120. ^ Dougan and Weiss, p. 126. ^ a b Dougan and Weiss, p. 127. ^ Dougan and Weiss, p. 128. ^ "Vietnam War U.S. Military Fatal Casualty Statistics". August 15, 2016. ^ Willbanks, pp. 148, 150. ^ Dougan and Weiss, p. 70. ^ Pentagon Papers, p. 594. ^ Dougan and Weiss, p. 72. See also Zaffiri, p. 305. ^ Clifford, p. 482. See also Zaffiri, p. 309. ^ Lyndon B. Johnson, The Vantage Point. New York: Holt, Rinehart, & Winston, 1971, pp. 389���392. ^ a b Pentagon Papers, p. 597. ^ The group included McNamara, General Maxwell D. Taylor, Paul H. Nitze (Deputy Secretary of Defense), Henry H. Fowler (Secretary of the Treasury), Nicholas Katzenbach (Undersecretary of State), Walt W. Rostow (National Security Advisor), Richard Helms (Director of the CIA), William P. Bundy (Assistant Secretary of State for Far Eastern Affairs), Paul Warnke (the Pentagon's International Security Affairs), and Philip C. Habib (Bundy's deputy). ^ Pentagon Papers, pp. 601–604. ^ Pentagon Papers, p. 604. ^ Major General Phillip Davidson, Westmoreland's chief of intelligence, reflected how the military men thought about Clifford's conversion in his memoir: "Clifford's use of the Wise Men to serve his dovish ends was a consummate stroke by a master of intrigue...what happened was that Johnson had fired a doubting Thomas (McNamara) only to replace him with a Judas." Phillip Davidson, Vietnam at War. Novato CA: Presidio Press, 1988, p. 525. ^ a b Johnson, p. 399. ^ Pentagon Papers, p. 623. ^ President Johnson was convinced that the source of the leak was Undersecretary of the Air Force Townsend Hoopes. Don Oberdorfer suggested that the Times pieced the story together from a variety of sources. Oberdorfer, pp. 266–270. Herbert Schandler concluded that the key sources included Senators who had been briefed by Johnson himself. Herbert Y. Schandler, The Unmaking of a President. Princeton NJ: Princeton University Press, 1977, pp. 202–205. ^ Stephens, Bret, "American Honor", Wall Street Journal, January 22, 2008, p. 18. ^ Clifford, p. 507. The group consisted of Dean Acheson (former Secretary of State), George W. Ball (former Under Secretary of State), General Omar N. Bradley, Arthur H. Dean, Douglas Dillon, (former Secretary of State and the Treasury), Associate Justice Abe Fortas, Henry Cabot Lodge (twice Ambassador to South Vietnam), John J. McCloy (former High Commissioner of West Germany), Robert D. Murphy (former diplomat), General Taylor, General Matthew B. Ridgeway (U.S. Commander in the Korean War), and Cyrus Vance (former Secretary of Defense), and Arthur J. Goldberg (U.S. representative at the UN). ^ The four dissenters were Bradley, Murphy, Fortas, and Taylor. Karnow, p. 562, Pentagon Papers, p. 610. ^ Pentagon Papers, p. 609. ^ Zaffiri, pp. 315–316. Westmoreland was "bitter" and was upset that he "had been made the goat for the war." Ibid. See also Westmoreland, pp. 361–362. Hammond, William H. (1988). The United States Army in Vietnam, Public Affairs: The Military and the Media, 1962–1968. Washington, D.C.: United States Army Center of Military History. Hoang Ngoc Lung (1978). The General Offensives of 1968–69. McLean VA: General Research Corporation. Military History Institute of Vietnam (2002). Victory in Vietnam: A History of the People's Army of Vietnam, 1954–1975. trans. Pribbenow, Merle. Lawrence KS: University of Kansas Press. ISBN 0-7006-1175-4. Schulimson, Jack; Blaisol, Leonard; Smith, Charles R.; Dawson, David (1997). The U.S. Marines in Vietnam: 1968, the Decisive Year (PDF). Washington, D.C.: History and Museums Division, United States Marine Corps. ISBN 0-16-049125-8. Ang Cheng Guan (July 1998). "Decision-making Leading to the Tet Offensive (1968) – The Vietnamese Communist Perspective". Journal of Contemporary History. 33 (3). Arnold, James R. (1990). The Tet Offensive 1968. Westport, Connecticut: Praeger. ISBN 0-275-98452-4. Blood, Jake (2005). The Tet Effect: Intelligence and the Public Perception of War (Cass Military Studies). Routledge. ISBN 0-415-34997-4. Braestrup, Peter (1983). Big Story: How the American Press and Television Reported and Interpreted the Crisis of Tet in Vietnam and Washington. New Haven CT: Yale University Press. ISBN 0-300-02953-5. Bui Diem; Chanoff, David (1999). In the Jaws of History. Bloomington IN: Indiana University Press. ISBN 0-253-21301-0. Bui Tin (2002). From Enemy to Friend: A North Vietnamese Perspective on the War. Annapolis MD: Naval Institute Press. ISBN 1-55750-881-X. Clifford, Clark; Holbrooke, Richard (1991). Counsel to the President: A Memoir. New York: Random House. ISBN 0-394-56995-4. Davidson, Phillip (1988). Vietnam at War: The History, 1946–1975. Novato CA: Presidio Press. ISBN 0-89141-306-5. Dougan, Clark; Weiss, Stephen; et al. (1983). Nineteen Sixty-Eight. Boston: Boston Publishing Company. ISBN 0-939526-06-9. Doyle, Edward; Lipsman, Samuel; Maitland, Terrance; et al. (1986). The North. Boston: Boston Publishing Company. ISBN 0-939526-21-2. Duiker, William J. (1996). The Communist Road to Power in Vietnam. Boulder CO: Westview Press. ISBN 0-8133-8587-3. Elliot, David (2003). The Vietnamese War: Revolution and Social Change in the Mekong Delta, 1930–1975. 2 vols. Armonk NY: M. E. Sharpe. ISBN 0-7656-0602-X. Hayward, Stephen (April 2004). The Tet Offensive: Dialogues. Johnson, Lyndon B (1971). The Vantage Point: Perspectives on the Presidency, 1963–1969. New York: Holt, Rinehart, and Winston. ISBN 0-03-084492-4. Karnow, Stanley (1991). Vietnam: A History. New York: Penguin. ISBN 0-670-84218-4. Lewy, Gunther (1980). America in Vietnam. New York: Oxford University Press. ISBN 0-19-502732-9. Macdonald, Peter (1994). Giap: The Victor in Vietnam. London: Fourth Estate. ISBN 1-85702-107-X. Maitland, Terrence; McInerney, John (1983). A Contagion of War. Boston: Boston Publishing Company. ISBN 0-939526-05-0. Morocco, John (1984). Thunder from Above: Air War, 1941–1968. Boston: Boston Publishing Company. ISBN 0-939526-09-3. Nau, Terry L. (2013). "Chapter 4: Tet Changes The War". Reluctant Soldier... Proud Veteran: How a cynical Vietnam vet learned to take pride in his service to the USA. Leipzig: Amazon Distribution GmbH. pp. 27–38. ISBN 9781482761498. OCLC 870660174. Nguyen, Lien-Hang T. (2006). "The War Politburo: North Vietnam's Diplomatic and Political Road to the Tet Offensive". Journal of Vietnamese Studies. 1 (1–2). Oberdorfer, Don (1971). Tet! : The Turning Point in the Vietnam War. Baltimore: The Johns Hopkins University Press. ISBN 0-8018-6703-7. Palmer, Dave Richard (1978). Summons of the Trumpet: The History of the Vietnam War from a Military Man's Viewpoint. New York: Ballantine. Pisor, Robert (1982). The End of the Line: The Siege of Khe Sanh. New York: Ballantine Books. ISBN 0-393-32269-6. Pike, COL Thomas F. (2013). Military Records, February 1968, 3rd Marine Division: The Tet Offensive. Charleston, SC: Createspace. ISBN 978-1-481219-46-4. Prados, John; Stubbe, Ray (1991). Valley of Decision: The Siege of Khe Sanh. Annapolis MD: Naval Institute Press. ISBN 0-395-55003-3. Schandler, Herbert Y. (1977). The Unmaking of a President: Lyndon Johnson and Vietnam. Princeton NJ: Princeton University Press. ISBN 0-691-02222-4. Schmitz, David F. (2004). The Tet Offensive: Politics, War, and Public Opinion. Westport CT: Praeger. ISBN 0-7425-4486-9. Smedberg, Marco (2008). Vietnamkrigen: 1880–1980. Historiska Media. ISBN 91-85507-88-1. Sorley, Lewis (1999). A Better War: The Unexamined Victories and Final Tragedy of America's Last Years in Vietnam. New York: Harvest Books. ISBN 0-15-601309-6. Stanton, Shelby L. (1985). The Rise and Fall of an American Army: U.S. Ground Forces in Vietnam, 1965–1973. New York: Dell. ISBN 0-89141-232-8. Spector, Ronald H. (1993). 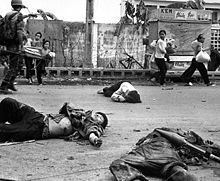 After Tet: The Bloodiest Year in Vietnam. New York: The Free Press. ISBN 0-679-75046-0. Tran Van Tra (1994). "Tet: The 1968 General Offensive and General Uprising". In Warner, Jayne S.; Luu Doan Huynh (eds.). The Vietnam War: Vietnamese and American Perspectives. Armonk NY: M.E. Sharpe. ISBN 1-56324-131-5. Westmoreland, William C. (1976). A Soldier Reports. New York: Doubleday. ISBN 0-385-00434-6. Wiest, Andrew (2002). The Vietnam War, 1956–1975. London: Osprey Publishers. ISBN 1-84176-419-1. Willbanks, James H. (2008). The Tet Offensive: A Concise History. New York: Columbia University Press. ISBN 0-231-12841-X. Wirtz, James J. (1991). The Tet Offensive: Intelligence Failure in War. Ithaca NY: Cornell University Press. ISBN 0-8014-8209-7. Zaffiri, Samuel (1994). Westmoreland. New York: William Morrow. ISBN 0-688-11179-3.